I can’t stop eating these cookies! If you’re in the mood for cookies full of chocolate chunks, candy and butterscotch, you have to give these a try. They do contain Greek yogurt – SURPRISE! 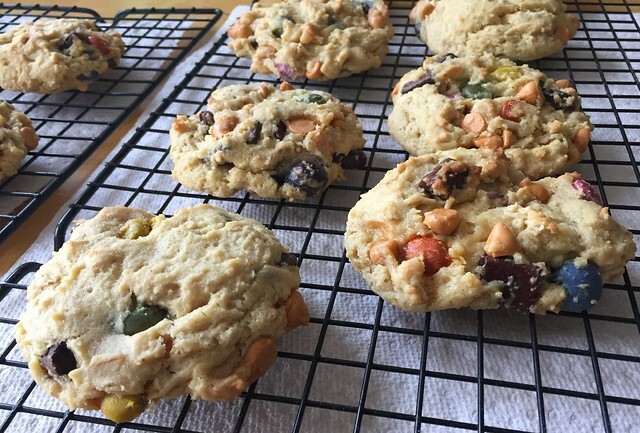 The yogurt takes the place of the eggs in these cookies. I used Stonyfield Organic plain nonfat Greek yogurt. They are loaded with all sorts of deliciousness – oatmeal, chocolate chunks, butterscotch chips, and UNREAL candy-coated milk chocolates. 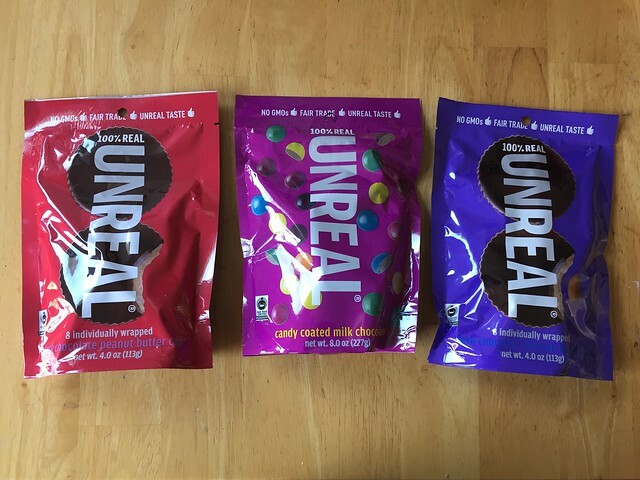 If you’re unfamiliar with UNREAL candy, check out their story here, but their products contain non-GMO, fair-trade/ethically sourced, and gluten-free ingredients. As part of this month’s challenge with the Stonyfield Organic Clean Plate Club, I received samples of UNREAL Candy’s dark chocolate peanut butter cups, dark chocolate almond butter cups, and candy coated milk chocolates. I was curious about the candy coated milk chocolates, as I’ve seen the other two at stores here. The candy coating color comes from natural sources such as beetroot and carrot juices, which I liked. Once I tasted them, I realize they reminded me a lot of Smarties, which are a British brand of candy coated milk chocolates that I absolutely love and cannot find that easily in the States. Needless to say, I’ll be buying more of the UNREAL version to get my Smarties fix! I decided cookies were the perfect vehicle for showcasing these candies. I used this recipe as my inspiration and then tweaked based on what I like to put into my cookies. I really like the idea of incorporating Greek yogurt into these cookies -it’s so unexpected but you really don’t notice it. I may have to try this trick in other cookie recipes as well! *Disclosure: Stonyfield Organic provided me with coupons for their yogurt and compensated me for this post as part of their Clean Plate Club. UNREAL provided me with samples of their chocolate candy as part of this month’s campaign. All opinions are my own. Preheat oven to 375 degrees Fahrenheit. Line 2 baking sheets with parchment paper. In a large bowl, cream together the sugars and butter until fluffy. Add in Greek yogurt and vanilla extract and stir to combine. In a separate bowl, combine the flour, oatmeal, cinnamon, baking soda, and salt. Add into the butter/sugar/yogurt mixture slowly until incorporated. 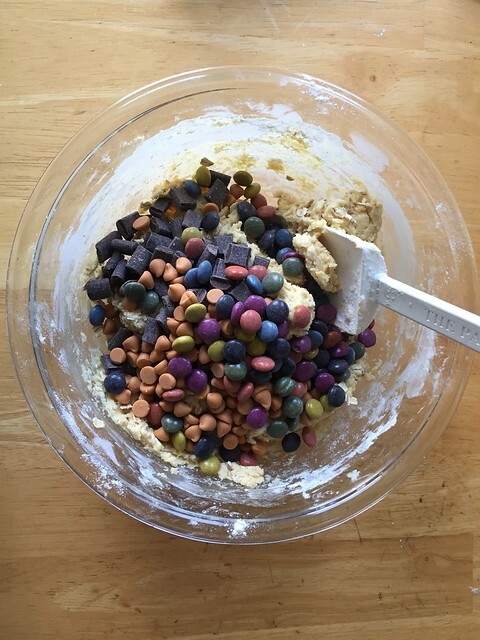 Mix in the chocolate chips/candies. Chill cookie dough in fridge for about 10 minutes. Use an ice-cream scoop to drop cookie dough onto the cookie sheets, keeping cookies 2 inches apart. These will be large mounds of dough, I got about 7-8 per cookie sheet. Bake for about 15-17 minutes or until the edges begin to turn golden brown. Take out of oven and let cool for a few minutes before transferring to wire racks. Augusto disse:ParabÃ©ns ao Poder AÃ©reo pela Ã³tima reportagem!Independentemente da configuraÃ§Ã£o final do cliente especÃ­fico, o Gripen E/F tem autonomia e alcance muito maiores, radar AESA, motor mais potente, maior capacidade de carga, melhores aviÃ´nicos, etc.Se Ã© verdade que a FAB avaliou bem o C/D, o que dizer do E/F! And France, the UK, Italy, All the rest of europe, even mexico has them for gods sake, even every single middle easter country. Leave your house and stop bieng cought in the lie that the us is like the awsome advanced country or anything like that.